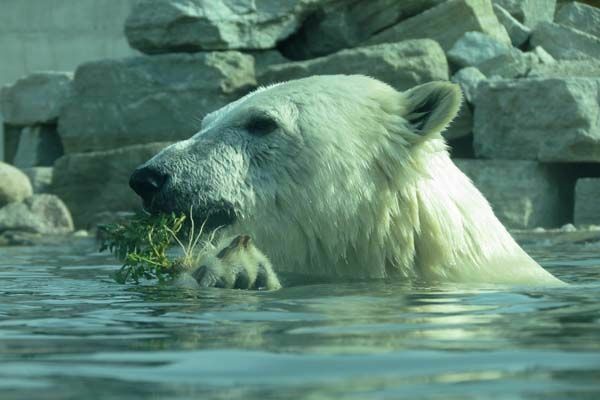 It’s good to cool yourself in the water on a hot summer day. 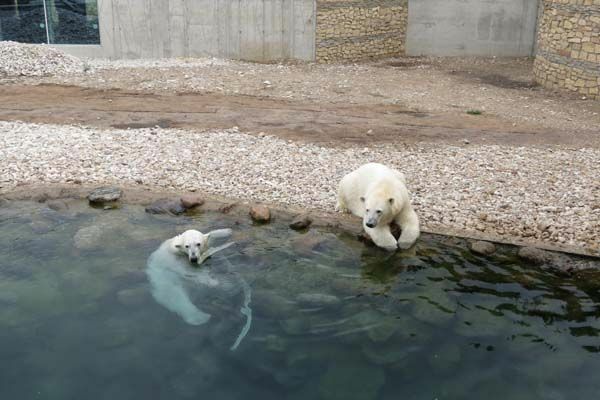 All of our polar bears, but especially Aron boy enjoy swimming in the new big deep pool. 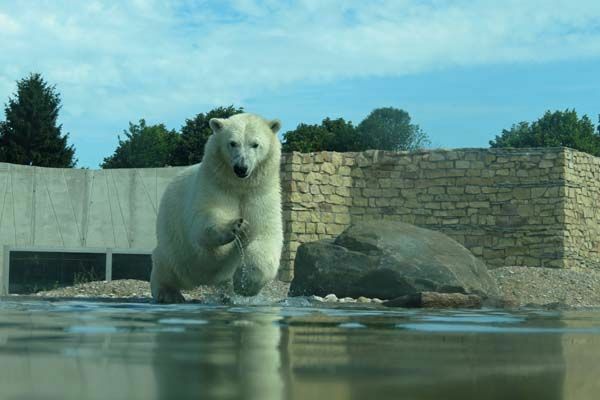 He loves playing with his different toys, diving and just watching the zoo visitors behind the window. Often he swims and plays so much in the morning, that in the afternoon he only sleeps! 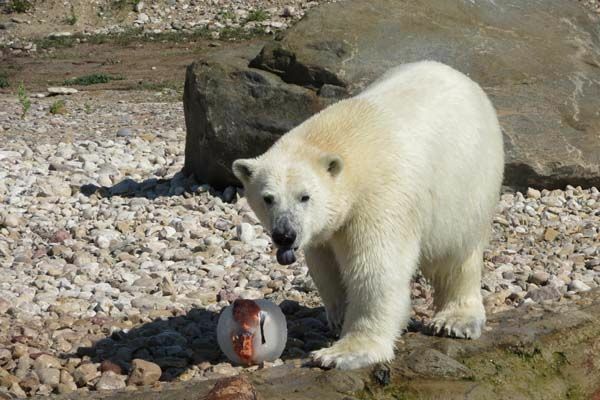 The keepers sometimes surprise the polar bears with some big ice “bombs”, which always contain something yammy, too. 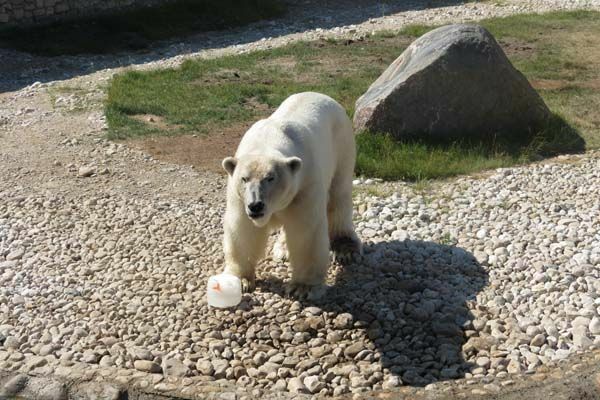 On July 22nd, there was “An ice cream day” in our zoo – all of our polar bears received the ice “bombs”. In the mornings Aron and Friida love playing together in the pool. 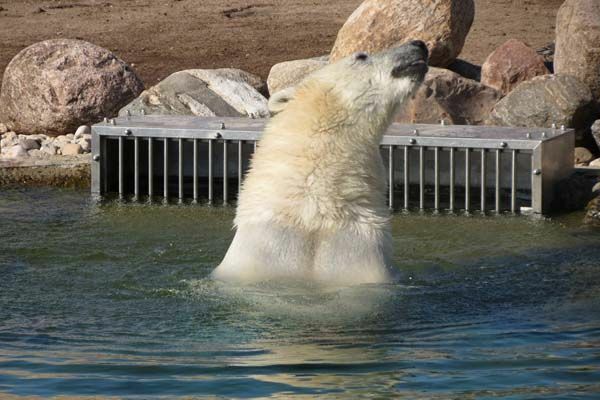 Nord also loves playing and diving in his pool. 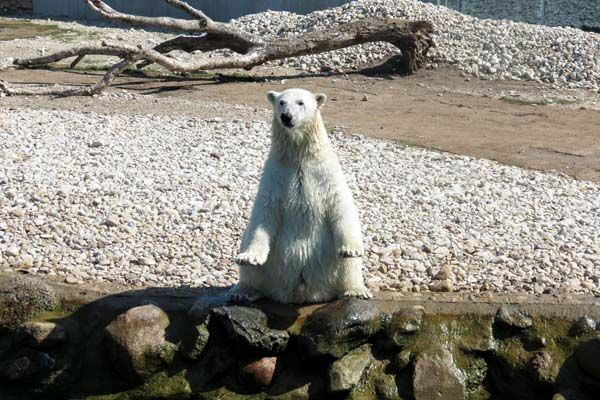 Nord often sits or stands in a definite place near the water and waits for Friida. He can see her through the glass and the visitor’s corridor. Aron is jumping into the water. He found some plants in the pool. 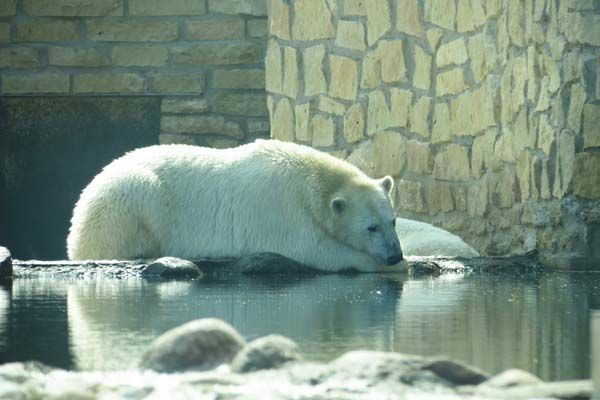 Aron has played with so much energy that he got tired and takes a nap keeping his paws in the water. 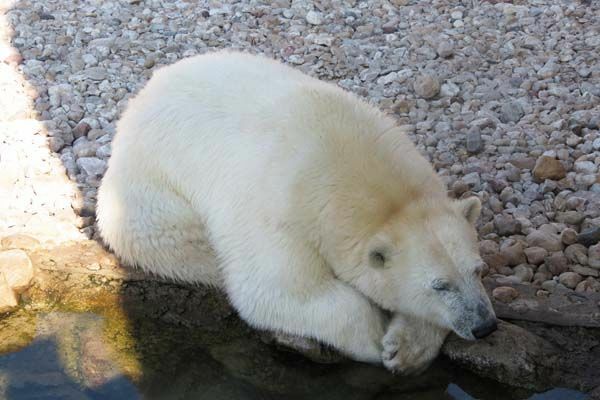 Nord in his favorite position (in the bottom picture). From us all to you all! 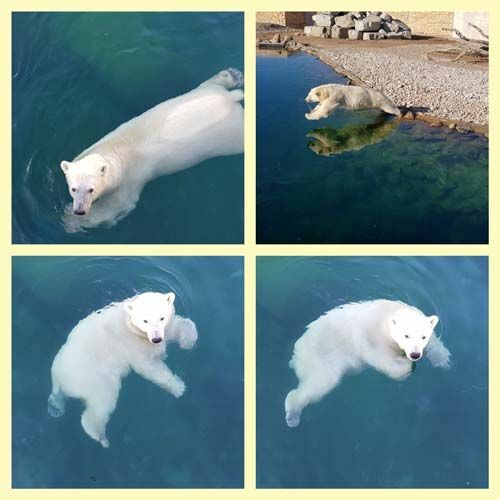 Because the heat wave doesn’t want to leave us it’s refreshing to see Friida, Aron and Nord having fun in the water. 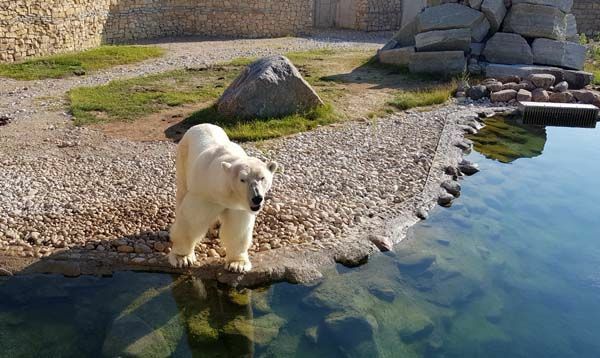 🙂 The polar bears in Tallinn have lots of enrichment and the water in their ‘pool’ – or rather a little lake – is very clear and clean. 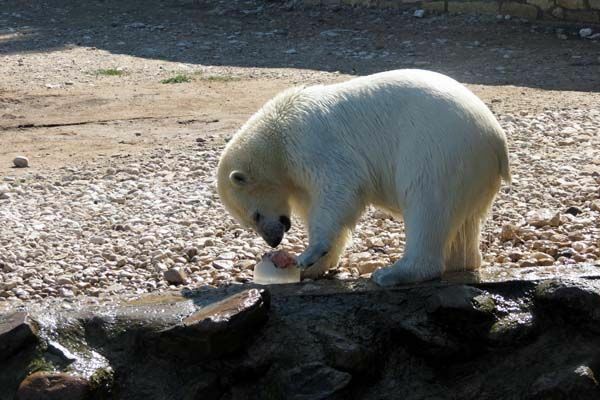 The Ice Cream Day is a very good idea although in this hot Summer every day should be an ice day. 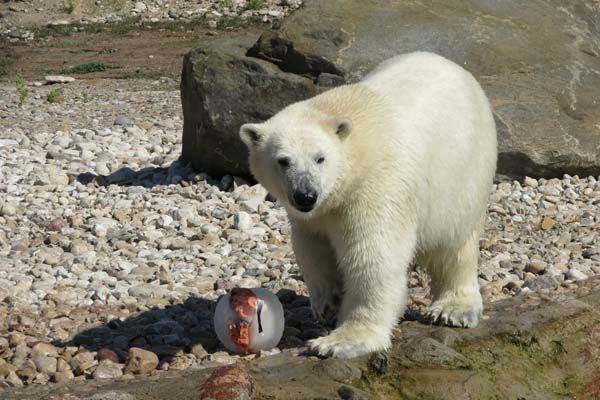 There’s no doubt the ice bombs are wonderful treats for the polar bears – nourishment and entertainment in one piece! Thank you so much for this cool report! Another very charming report from TALLINN, indeed! ARON, FRIIDA, and NORD look right contented and are so pretty. You made nice pics and videos, dear EVI. Thank you very much! What a nice ‘greetings-idea’ in the end, saying “From us all to you all”. Thank you for the news from Tallinn. Aron and Frida look very nice. They have the toys and play together too. 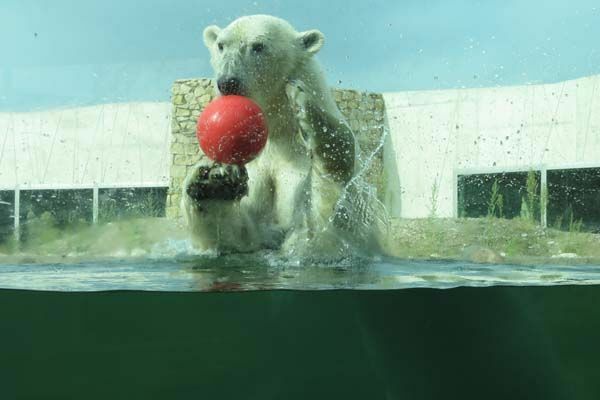 I am very glad to see Nord with a ball in the water. I hope his wound is healing well. It’s not just too hot for humans right now. 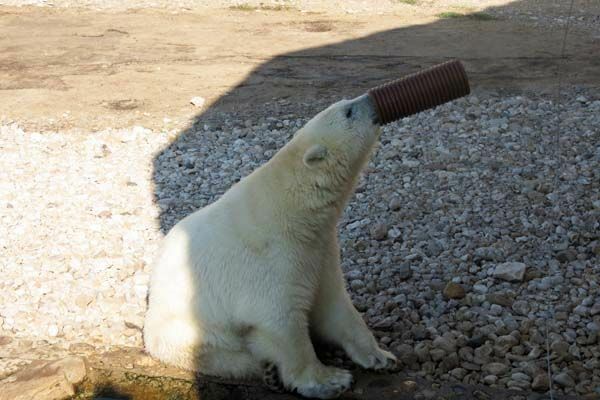 But the bears don’t complain and do it just right. 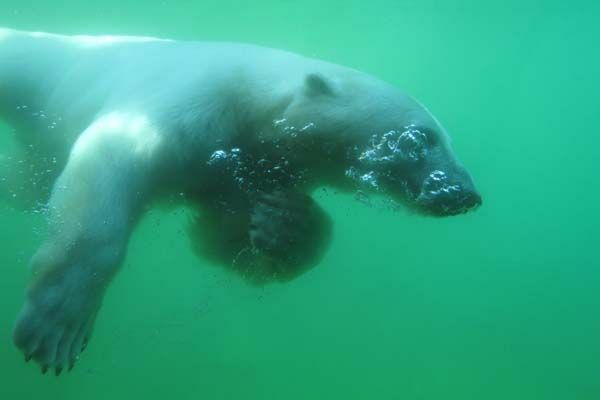 Being in the water a lot, just not spending too much effort and often an ice bomb. Thank you very much for your nice report with the great pictures and the cute videos. 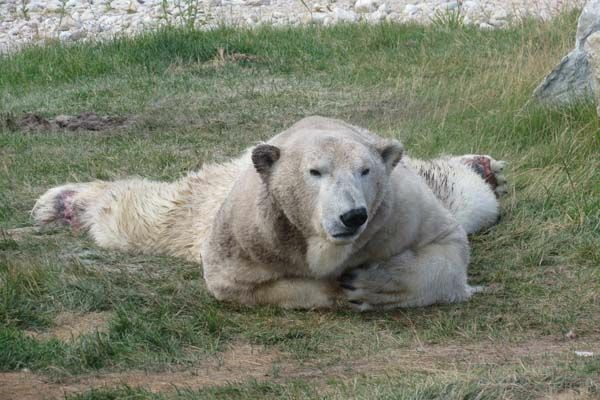 All bears seem to be in excellent condition. Aron has grown big. Is Nords paw o.k. now? 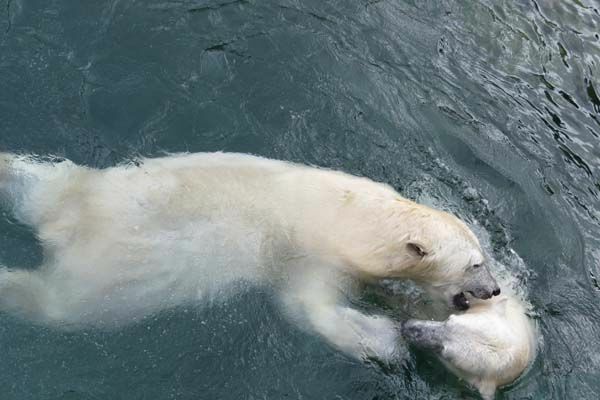 it’s so good to see these exciting pictures of the wonderful polar bears in Tallinn! 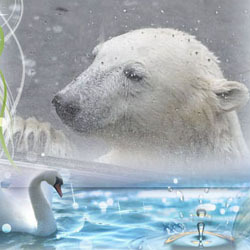 Aaron is such a fine polar bear boy and Friida and Nord are just beautiful!! Thank you for these gorgeous and refreshing pics and videos. Everything has been said and I actually don´t want to repeat it. 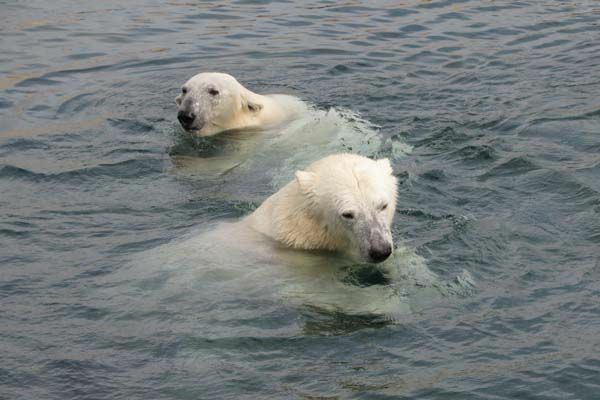 I´m glad the bears are doing fine, they have a fabulous pool, get ice bombs and are able to cool down at any time. Did I already mention they all look great? Hopefully his paw is healing now! What a splendid report. 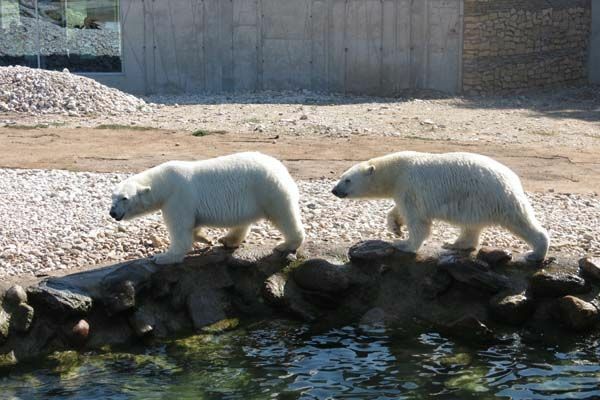 I am not too far away in Aalborg so am enjoying your water bears. Mutter und Sohn geht es prächtig und Nord hat auch seine Freude an dem schönen neuen Gehege. Jetzt hoffen wir nur daß seine Tatze wieder gesund wird. Danke dir, für wunderschöne Bilder von den 3 Bären. Thank you all for taking your time to write nice comments! 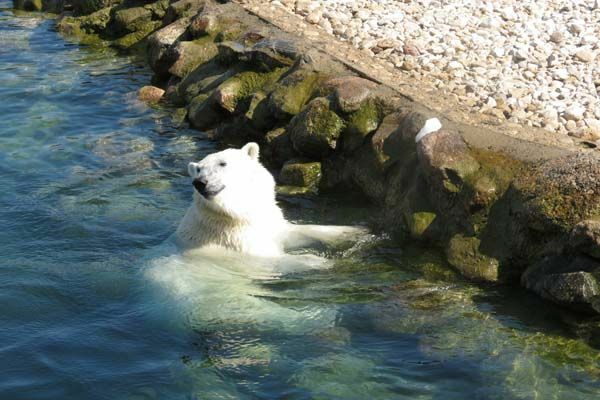 It’s great, that our polar bears at last have large swimming pools to cool yourselves in a hot weather! Aron enjoys this, of course, the most. Friida often plays together her son, too. 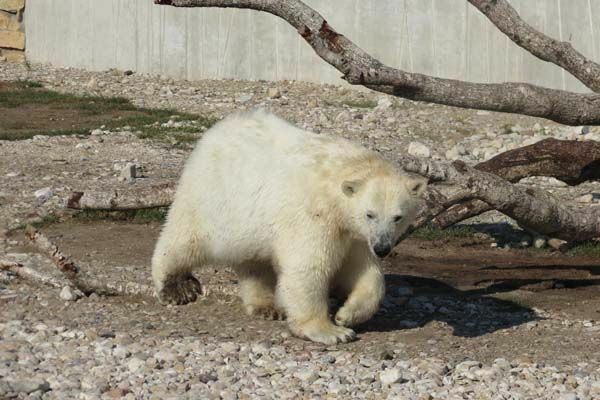 Nord is playful and he seems to be glad in the new enclosure, but his paw does not improve. Something like the same has even appeared on his other paw, too.Treatment continues and let’s hope that everything will be fine soon! The nice greeting idea is from Mervi. I am sending the best wishes to Nord. 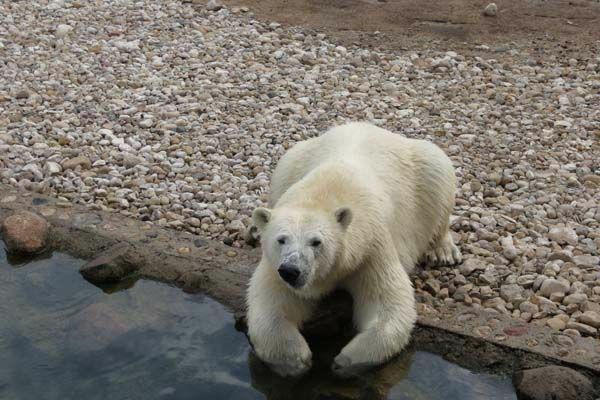 I’ll visit our bears today and I’ll give your good wishes to Nord. Even I hope Nord’s paw is getting better! 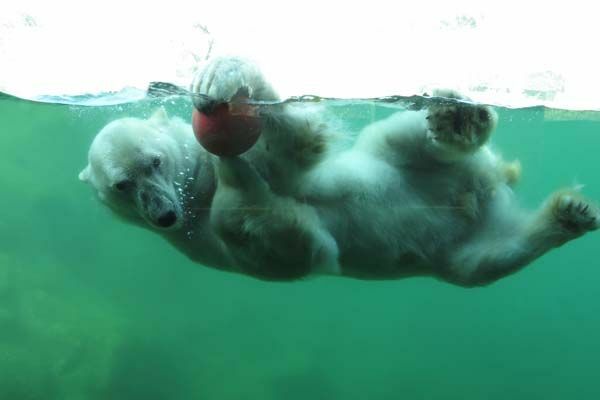 However it’s good to see him playing in the water despite his ‘handicap’. Log in | 53 queries. 0.811 seconds.